On April 25, Blackville School principal Rodney Buggie was happy to hold a short assembly commemorating UNB freshman Aaron Dunn for his excellence in baseball. A graduate of Blackville, Dunn received the Rookie of the Year and Pitcher of the Year for UNB's 2017 baseball season, and is travelling to Europe in May to play for the North American Collegiate Baseball team. Dunn was presented with a $150 cheque on behalf of the school community to help with his travel costs. Mr. Buggie wishes to start a tradition where Blackville School honours former students who have achieved great things, whether it be in academics or extracurriculars. Students and staff at Blackville School were encouraged to wear hockey jerseys on Thursday, April 12 in a display of solidarity with the Humboldt victims and survivors of the Saskatchewan bus crash that killed 16 people and injured 13 others. 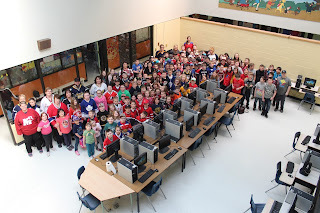 The students, from elementary and high school, joined Canadians from across the country to show their support for the Humboldt community. For more national news on this day of solidarity, click here. Over the past month, Hockey New Brunswick hosted their annual Provincial Hockey Championships at the AAA level to wrap up the season. Some of the participants included Blackville/Renous' own Kaden McNeil, Owen Underhill and William Schofield. Kaden McNeil was named to the Miramichi Peewee AAA Rivermen at the start of the season. As a first year defenceman, McNeil wanted to prove his worth and improve his game throughout the season. McNeil played an important role in the Rivermens successful season, recording about 20 points. The Rivermen first headed to Zones, which decided who would be heading onto the Provincial Championship weekend. Zones were hosted on McNeil's home turf at the Renous Arena. He used this advantage to its full extend and played in one of the best weekends of hockey in Rivermen history. McNeil's team won its most important game of the season against long time rival the Acadian Peninsula Lynx in a nail biter 3-2. They then came out on top over the Chaleur Titans in a placement game to gain the first place seed in the Northern Zone. At the Provincial Championships, the Rivermen had a tough weekend, dropping their first 2 games to the Hawks and Pioneers. They redeemed themselves with a tie against Saint John to finish off their season. McNeil recorded 2 assists over the weekend's hockey action. McNeil was happy with the outcome of his first AAA season and quite satisfied with how far his team was able to go. He is hoping to be listed to the Rivermen's roster again for the following season and take on a bigger role as a second year player. His work ethic and constant desire to develop and improve his game keeps McNeil focused on his goals. McNeil has a definite love for the game and is a prime example of the hockey talent that our small area has to offer. 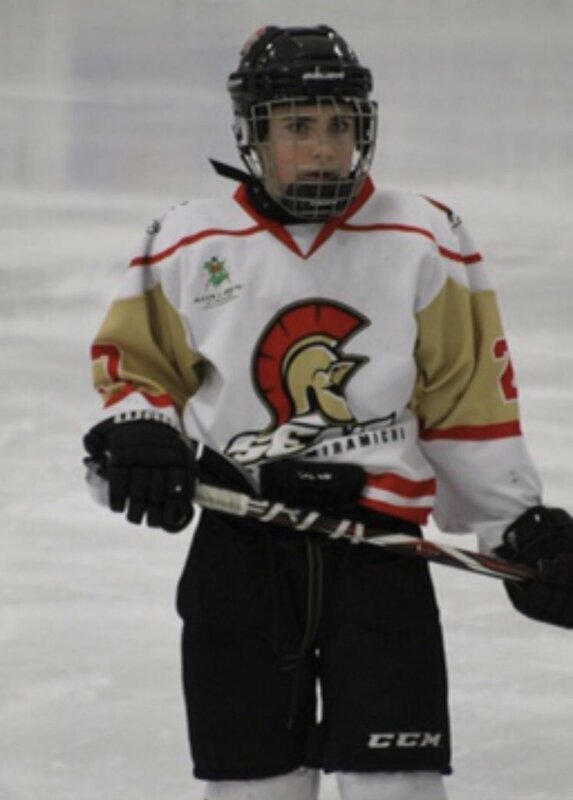 Owen Underhill was named to the Bantam Minor Acadie-Miramichi Senators at the beginning of the 2017-2018 season. Underhill was excited to get the season rolling and play the game he loves at the AAA level. He had a very successful season in his first year of Bantam hockey, recording 14 points in 28 games. His team headed into provincials locked in the 5th place slot. Underhill's point magic continued into his Provincial push, recording 4 points throughout the weekend. The Sens were this years host team for the Bantam Minor Provincials in the Shippigan/Lameque area. They started off the weekend on a good note with a tie against the Bouctouche Phantoms. Underhill's team then took a hard loss to the Pioneers. After a close fight against the Fredericton Capitals, the Sens unfortunately dropped it to the later Provincial Champs. Underhill had 1 assist against the Caps. The Sens ended their season on a high note, defeating Saint John 6-1. Underhill's determination and hard work allowed him to record 3 points in his final game of the season. All in all, Underhill believed that his team had a great season. He had a lot of fun playing at the highest level for his age and was pleased with his performance and constant improvements throughout the season. Underhill hopes to be heading to Bathurst next season to play on the Bantam Major Northern Blackhawks. Hockey has always been a passion of Underhill's and his dedication and love for the game seems to be paying off. William Schofield started off his final season of Bantam, playing for the Bantam Major Northern Blackhawks. Schofield took on a big role with his team from the word go. In 27 games, he recorded 18 goals and 16 assist for a total of 34 points, good enough to lock down the 4th place position for goals, assists and points in the league. 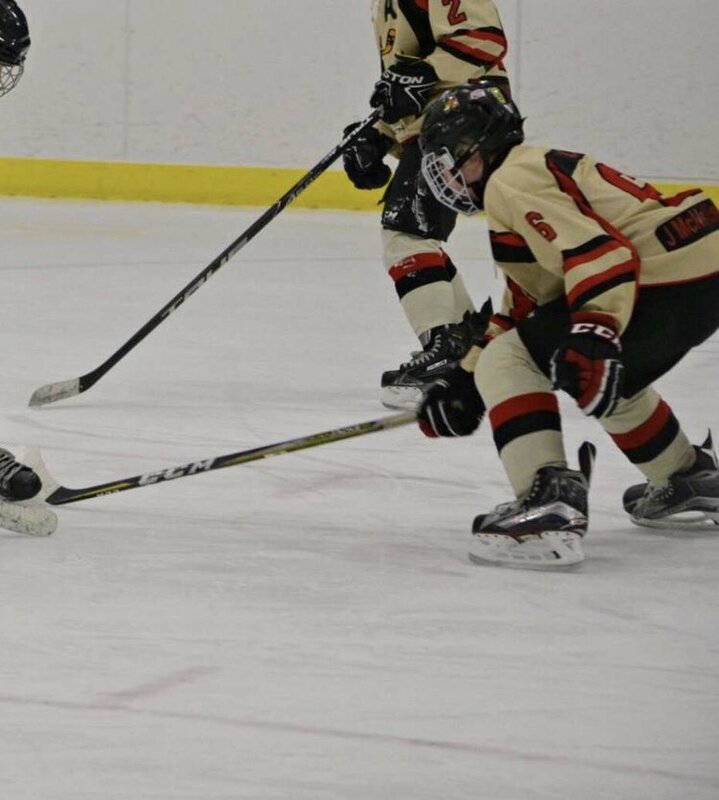 At the Bantam Major Provincials in Edmundston, Schofield led his team with 3 goals and 4 assists for 7 points in 5 games. The Blackhawks started off the tournament with a 3-1 win against Dieppe, Schofield had 2 goals to help his team with the win. They beat the KV Kings 5-3 while Schofield recorded a goal and 2 assists. After dropping a tough one to the Moncton Hawks, Northern rallied back from a 2 goal deficit, to tie Saint John 3-3, Schofield's assist helped Northern book their ticket to the Provincial Semi Final. They sealed 2nd place in the round robin. Northern dropped a heartbreaking game 3-2 in the semis to the North West Bulls who went on to win Provincials and are headed for the Atlantic Championship in Newfoundland. Schofield's hard work and ability to rack up points got him noticed by the Midget AAA coaching staff. After making the first cut for the Midget AAA Northern Moose as an underage player in September and participating in a rookie tournament, Schofield had 1 assist in two games. He was an underage call up for the Moose during the Ice Jam in Halifax, Nova Scotia. Schofield played a large part in the Mooses success at this tournament. In 3 games, he recorded 1 goal and an assist, including the game winning goal in a shootout that brought the Moose over the Charlottetown Pride to advance to the Semi-Finals. In the semis, the Moose lost a close game 3-2 to Cape Breton West, the defending National Champions. Schofield's call ups continued throughout the NBPEIMMHL playoffs, where he took on a bigger roll centering the first/second line for the Northern Moose. In the first to 8 elimination series, he recorded 2 points in 4 games as the Saint John Vitos ended the Mooses season. Schofield was pleased with his season personally and on a team level. He knows that there is always room for improvement and that the hard work never stops in getting him where he wants to be. He hopes to be named to the Northern Mooses Roster for the 2018-2019 season. "I plan on putting a lot of hard work in during the off season. Midget hockey is a lot different from the Bantam level. Getting a taste of that fast paced game, makes me know even more that I need to put a lot of work and practice into developing my game to be Midget ready. I'd like to extend a thank you to my coaches this year, Phil Nazair and especially Charles Leblanc for putting trust in me as an underage player and pushing me to my limits so I can play the best to my abilities." Senior girls Athlete of the Month has been awarded to grade 10 student Jayna Brennan for her involvement on the Senior Girls Hockey team. Jayna is a very hard working player and always gives her best effort when out on the ice. Jayna was recognized for her award because of her strong scoring output during the playoffs for the girls. Jayna scored 2 big goals in the girls do or die game against Neguac to help the team move on. She also scored a goal against Sunny Corner in the girls best of 3 series against them, to help the team move on once again. Jayna then went on to score the only goal in the girls final series of the season against Caraquet. Besides Hockey, Jayna also is a part of the Senior Girls Soccer and Basketball teams as well as the JV Volleyball team. Senior boys Athlete of the Month is grade 12 student Aaron Walls. Aaron has been awarded this because of his involvement on the Senior Boys Hockey team. Aaron had a big month playing very well at the boys Provincials in Renous. Aaron had a 5 goal game in the boys final game of the season, which was an elimination game against Nackawic. Aaron also was awarded the Player of the Game because of his efforts in this one. Besides his scoring, he is a very hard worker and leaves it all on the ice every game. He will be greatly missed by the hockey and soccer teams next season.